I Love Cartoons – about Charter Schools! Rocketship (see Barbara Miner’s report from our new Save Our Schools issue) uses computer programs to teach children for a significant portion of the day, and eschews “extras” like school librarians, art, gym, and social studies, which further reduce staff costs. This combination of real teachers and online programs, dubbed “blended learning,” is the fastest-growing sector of the burgeoning charter school industry. “The call for public schools to be replaced by such tech-heavy, teacher-light operations comes from some of the most powerful actors in local and national politics,” Lafer wrote in his report. If you would like to read The Progressive’s entire article, click here: ProfitShip Learning | The Progressive. Read the whole piece by clicking HERE. Should You Read the Book “Losing Our Way”? I read the book Losing Our Way by Bob Herbert over Thanksgiving. Several of my fellow bloggers recommended it so I was eager to begin reading the book when it arrived. After finishing the book I was at a loss as to how to write about it. Then last weekend I saw the movie “Interstellar“. The movie had beautiful scenes, complex characters, an interesting plot yet I came out of theater scratching my head knowing I missed something. I had that same experience after reading Losing Our Way. When I first heard about Losing Our Way I was excited to think that someone had put their finger on the malaise that seems to surround us now. I was hoping Herbert could trace the roots of some of America’s biggest problems and provide some magical formula as to how to put America back on the right course. Perhaps that was too much to expect. It wasn’t until after reading the book that I took a closer look at the cover and saw that Herbert sub-titled his book “An Intimate Portrait of a Troubled America”. That’s what he did a good job at – superbly documenting some of the troubles we are experiencing. Don’t get me wrong – Losing Our Way was a very enjoyable book to read. Herbert was an op-ed writer for the New York Times for many years and is an excellent writer. He delves deeply into the lives of a few people and tells their story, using them as exemplars of some of the troubles America has. His stories are compelling and written with compassion. So what troubles do we have? SPOILER ALERT! War is bad. Killing and maiming people during war is bad. Our infrastructure is bad. Fewer people in the middle class is bad. Wealthy people are bad. Education reformers are bad. To his credit, Herbert did and excellent job of describing the attacks on education. If you’re wondering why I am concerned about public education I would suggest reading Herbert’s book as he told the story much better than I have. 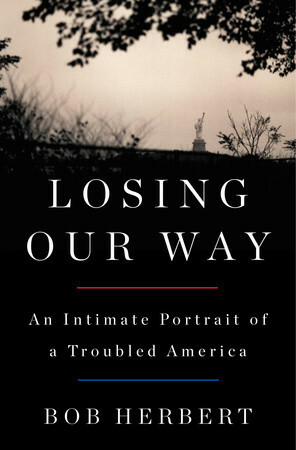 Should you read Losing Our Way? I think you should. My more conservative friends have now been forewarned that some of the judgmental language will put you off. That shouldn’t stop you from reading the poignant stories of people who have been hurt by some of the mistakes America has taken. My more liberal friends will have many of their beliefs about America validated. Herbert did a great job of documenting some of the problems we Americans are experiencing. He wants us to get mad enough about those problems to do something. He left it up to us to come up with the solutions.